Another round of wintry weather and slick travel concerns. Another week and another chance of snow. A weak storm system looks to roll across the country from the West Coast into our neighborhood come late Thursday into early Friday morning. Temperatures look cold enough for frozen precipitation in the form of snow for those living north and west of Baltimore. 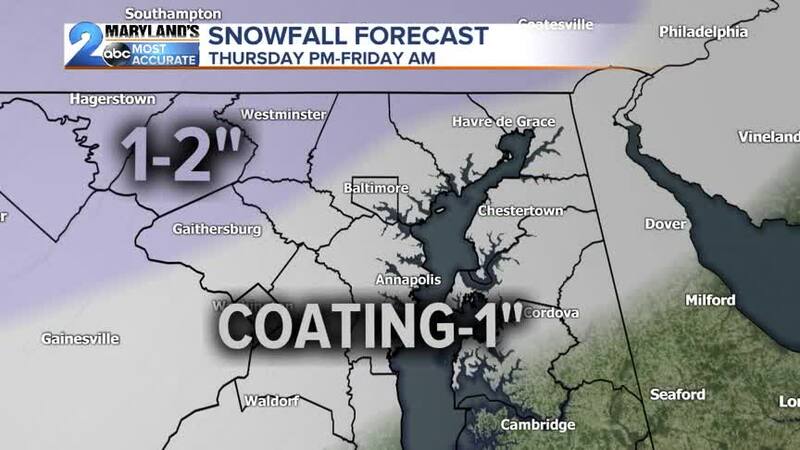 A dusting to 1" of snow is likely along I-83 NB from Towson to Parkton and along I-70 W from Sykesville to Frederick. Higher amounts closer to 1" are likely from Thurmont back to Hagerstown along South Mountain and I-68 W into Cumberland/Oakland. Heading south on I-95 and I-97 toward the Eastern Shore temperatures look to be right around 32 degrees making for an icy/rain mix instead of snow. Slick travel concerns and the potential for a few school delays early Friday morning. After this system moves out an even bigger one arrives over the weekend. The predominant precipitation type with this storm system though looks to be rain as the area of low pressure cuts up over the mountains. On the back end of this storm though is a powerful cold front that will translate into a brief changeover of snow Sunday afternoon. After the front passes temperatures take a nose dive. A major polar plunge and flash freeze is likely Sunday night and into the day Monday. Overnight lows will dip into the single digits with wind chill values upwards of 10 degrees below zero come early Monday morning. Highs on Monday will barely make 25 degrees. Grab the hats, scarves, and heavy parkas as we enter the core of Winter.